Welcome to Transformation on a Thursday. I am devoting each Thursday to a positive affirmation or to inspirations in my life. There are so many ways we transform ourselves. It may be through meditation, by taking a class to learn something new, by involving ourselves in public service, or even changing something in our homes. Last week I took a class to get CPR certified. It was just something I wanted to learn and to do for myself. This week I am in the middle of a 21 day meditation challenge. I am going deep within each morning and finding that inner sanctuary. 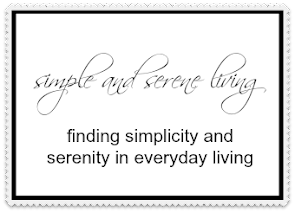 I hope you will take time today to find your own inner sanctuary while facing the challenges of our fast paced world. I wish nothing but inner peace for each one of you. I like the sound of the 21 day challenge. I like the sound of it, too and would love to hear more about it! I'll pin this photo today sweet friend! Hugs! You are so right. A few minutes from the chaos sounds like good medicine. Great saying. I make sure I focus my inner strength everyday! I love my quiet time, don't know if I could survive without it. I'll look forward to hearing more about your 21 day challenge. I look forward to my Thursdays with you every week, sweet Laura!! I find that peace when I do yoga stretching twice a day. I need to start meditating too.